Do you still need Christmas gift ideas? 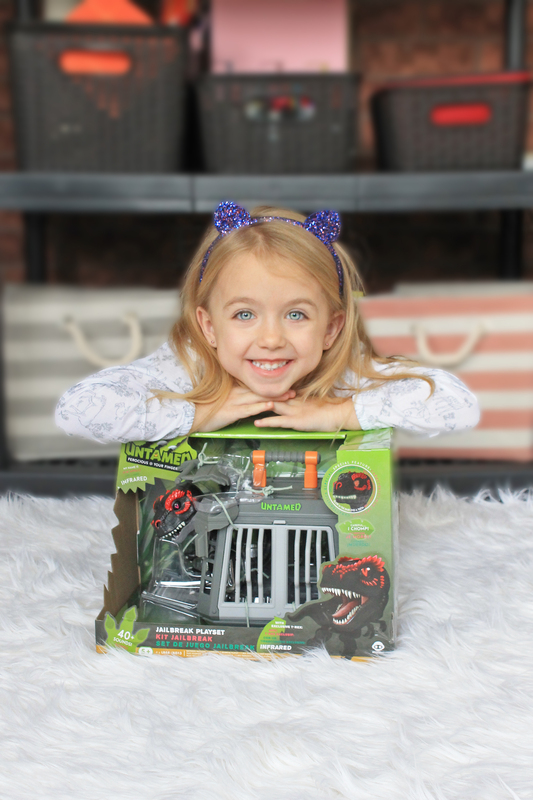 Today I am sharing My Top 3 WowWee Holiday Gift Ideas! With all the toy options out there it is hard to know what the hot toys are. Even harder if you aren’t a parent with a list written to “Santa” from your kids. 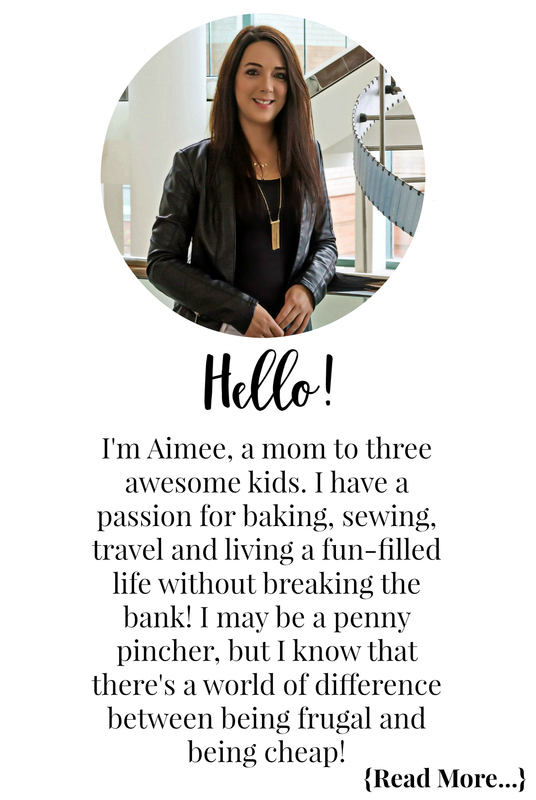 Back in October, I was invited to a holiday media event where I got inside scoop on some of the hottest toys for gift giving. Bella had such a blast at the event, she played with so many toys and definitely had favourites. One of the brands I met at the event was WowWee. If you don’t recognize the brand name, they are the ones behind the Fingerlings craze! Anyone remember last year? Finding those things was like trying to find a needle in a haystack. Well, they have some cool new toys and an awesome game out just in time for the holidays. 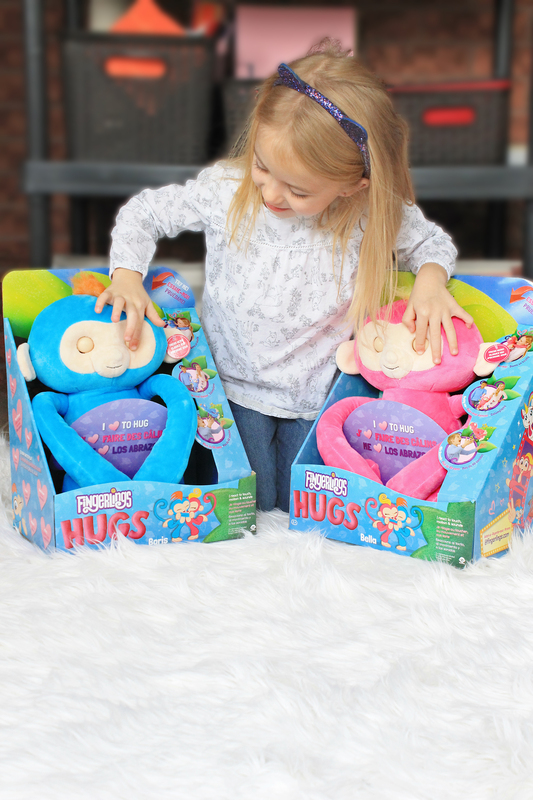 Meet Fingerlings HUGS – they’re softies when it comes to affection! They have supersized reactions to all of your actions. From burps to toots, yes … toots, to laughs, there’s never a dull moment! Your HUGS will show you how excited they are when you throw them in the air, swing them, tickle them and turn them upside down. These sweet monkeys love nothing more than to give you some TLC. Press their mouth to your skin to get a kiss and the longer you hold it, the longer the kiss will last. Mwaaaaah! Press and hold your HUGS’ left ear while you talk. When you let go, your HUGS will repeat what you say in funny ways. They never stop monkeying around! This was the first toy Bella laid eyes on at the event and once she got her hands on it, she didn’t want to let it go! 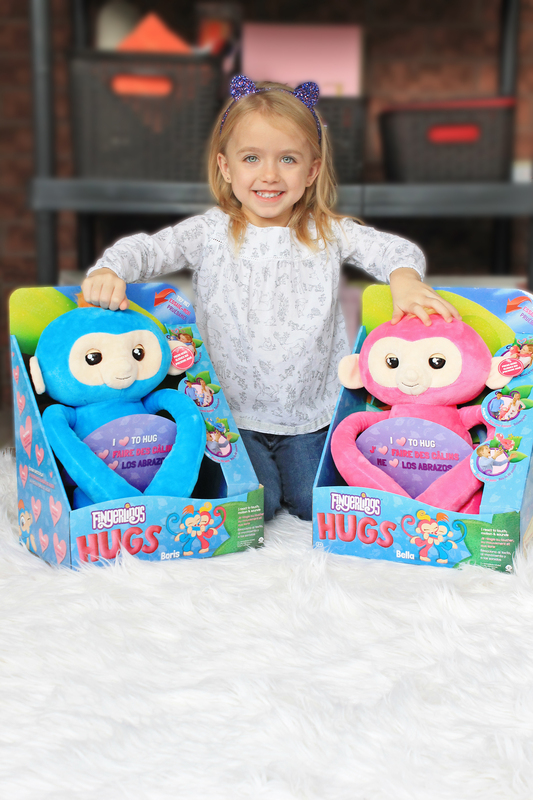 You can buy Fingerlings HUGS Bella (Pink) or Boris (Blue) online at Amazon.ca for my Canadian readers. For my US readers, you can buy Fingerlings HUGS Bella (Pink) or Boris (Blue) online at Amazon.com. What happens when Fingerlings Untamed dinosaurs get a little too ferocious? You give them a time-out in the Jailbreak Playset! 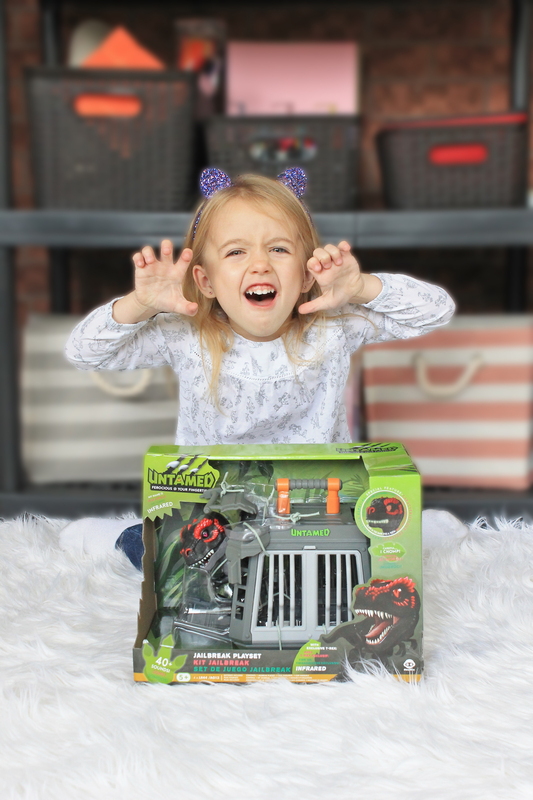 This special cage comes with Infrared, an exclusive T-Rex with eyes that glow in the dark and a fierce desire to escape. Infrared is his name and escaping is his game. The Jailbreak Playset holds up to two Fingerlings Untamed creatures. Will they be friends or foes? That depends on you. Will you tame them into friendly companions or unleash their inner beasts? Your T-Rex reacts to sound, motion and touch. Bella loves all things dinosaurs and I think she makes a good one too! You can buy the Fingerlings Untamed Jailbreak playset online at Amazon.ca for my Canadian readers. For my US readers, you can buy the Fingerlings Untamed Jailbreak playset online at Amazon.com. 3. What’s That Smell? The Party Game That Stinks! This hilariously fragrant guessing game will put your sniffer to the test with over 50 smells from nice to downright nasty! Hey, I know people who subjected themselves to eating jelly beans that tasted like rotten eggs and vomit, smelling something sounds better to me LOL. The winner gets to pick the loser to suffer the Whiff of Shame! You can download the free App to keep track of time, get bonus points and capture the loser’s recoiling face in super slow motion glory. The cards will last over and over and come folded to conceal the answers … and keep the smells contained! Bella agrees that this must be one stinky game (no she couldn’t smell it through the packaging) and is glad she is too young to play. This has been placed at the top of our list for our next family game night, I can’t wait to make the kids smell something stinky! You can buy the What’s That Smell? game online at Amazon.ca for my Canadian readers. For my US readers, you can buy the What’s That Smell? game online at Amazon.com. And don’t forget to check out more amazing toys and games from WowWee on Amazon.ca and Amazon.com! Disclosure: Although we were sent product for consideration, the opinions and language are all my own, and in no way do they reflect WowWee. Any product claim, statistic, quote or other representation about a product or service should be verified with the manufacturer, company, provider or party in question. My son saw the jailbreak set at Walmart the other day. It shot to the top of his wish list! My kids would love all these! 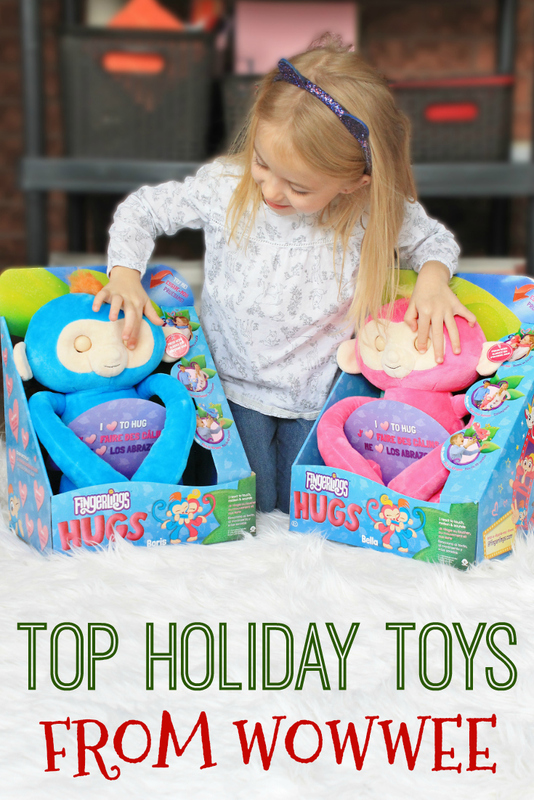 The HUGS monkeys are so adorable & I have a dinosaur lover over here too! What’s that smell sounds like a funny game to play, and i love the monkeys!! My daughter would love the Fingerling Monkey. My son is crazy for dinosaurs!! Fingerlings Untamed Jailbreak Playset!